Update, August 23, 2014: The digital art series mentioned in this blog post will be displayed at a future date at the Nature Center. The work on display there during ‘Raiders of the Lost Art’ exhibit includes my traditional oil paintings, acrylics, drawing and lino-cut prints, in addition to the work of Eugenia Vainberg and members of The Western Reserve Calligraphers Club. 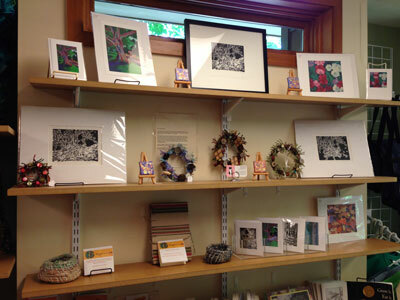 Art by Janet Dodrill in the Duck Pond gift shop, at the Nature Center at Shaker Lakes. A few months ago I brought some art work in for consignment at the gift shop, the Duck Pond, at the Nature Center at Shaker Lakes. Bringing only nature-themed work, the work includes note cards, lino-cut prints, art prints, mini oil paintings and wreaths. Since then, I developed a new body of work. With an iPad, I photographed nature on the premises of the Nature Center, ran them through an art app, and created what I call ‘The Nature Center at Shaker Lakes Series.’ Some of these images are currently for sale in the gift shop on large note cards. 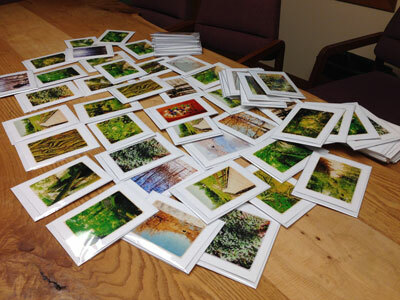 Note Cards by Janet Dodrill at the Duck Pond gift shop, at the Nature Center of Shaker Lakes. My contact there asked if I would participate in a group art exhibit in their gallery, for works that are nature-based, entitled ‘Raiders of the Lost Art’ running August 18 through November 7, 2014. Some of the images from this series will be enlarged to include in the show. The Nature Center is located at 2600 South Park Boulevard, Shaker Heights, Ohio 44120, www.shakerlakes.org. The Nature Center at Shaker Lakes iPad photo art by Janet Dodrill. You are currently browsing the Janet Dodrill's Blog blog archives for June, 2014.